Elecard AVC HD Suite is a set of applications for high-quality decoding, simple editing and conversion of video footage shot by AVCHD® digital camcorders, such as Sony® HDR-SR1E, Panasonic® HDC-SD1. Elecard AVC HD Suite comprises Elecard AVC HD Player, Elecard AVC HD Editor and Elecard Converter Studio AVC HD Edition. Elecard AVC HD Player is designed for high-quality decoding and playback of the popular multimedia formats including, among others, AVCHD, H.264/AVC, MPEG-4 SP/ASP, MPEG-2, MPEG-1 and 3GP. It combines robust functionality of the popular Elecard MPEG Player, innate H.264/AVC support (without the need to install Elecard AVC PlugIn) and comes with the new exclusive skin. 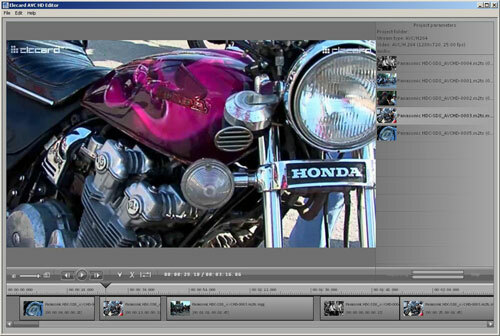 Elecard AVC HD Editor application allows simple and fast editing of video content delivered in the AVCHD format. It provides accurate reordering, trimming and merging of video clips without any need of transcoding. Elecard AVC HD Editor is compact, powerful and easy to use: an excellent solution for everyday video editing purposes. Elecard Converter Studio AVC HD Edition is the special edition of Elecard Converter Studio dedicated to conversion of AVCHD video clips to other widely spread formats like MPEG-2, Blu-Ray, HDV, DVD and DV. It also creates files for Sony PlayStation3, Apple iPhone and iPod of all modifications. And not only that, users can also convert their video files to Flash Video format, commonly used by such portals as YouTube, Google Video, Yahoo! Video, Reuters.com, and many other news providers. Watching and preparing your own home-made high definition videos to be shared with others has never been so easy. Powerful, flexible and convenient - Elecard AVC HD Suite is the perfect solution for AVCHD multimedia enthusiasts.